A truely wonderful plant is the The Bird of Paradise, the flowers is said to resemble a cranes head, hence the common name. 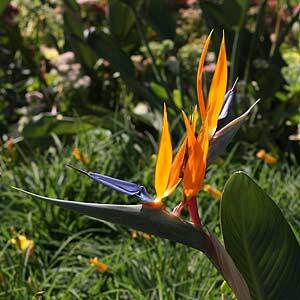 Available for sale from online and retail nurseries Strezlitzia reginae is also know as crane flower are a striking tropical plant that grows well in cooler conditions as far south as Melbourne. Both the foliage and the flowers give the garden a tropical look, the grow well in the ground as well as in containers and fit in well to a Balinese style garden. Winter flowering with spectacular flowers (see picture right) Strezlitzia Reginae is perhaps the most common of the species, however a number of other varieties exist including S. nicolai a giant type. Full sun and a well drained soil is essential, although in warmer areas part shade is also OK.
Stelitzias are generally a hardy plant preferring full sun to part shade and a well drained soil, be careful with fertilization as over fertilization can result in excessive foliage growth and less flowering. Some varieties also are larger growing than others. Growing particularly well in sandy soils, they do make an excellent plant in coastal areas. Consider Strelitzia growing in a pot. The bird of paradise is a plant that will reach a height of around 1.5 to 2 metres depending on conditions. Check that soil has good drainage. Dig the soil over well before planting adding some well rotted composting cow manure. In containers use a good quality potting mix that drains freely. Plant at the same depth the Strelitzia was in the container and water in well with a liquid seaweed fertiliser. Water regularly as the soil dries a little trough the first summer. Both Strelitzia reginae and S.nicolai can have problems with foliage. On the larger S.nicolai the leaves do tend split in the wind, and other than grow the plant in a protected position you can’t do much about that. The same problem can occur with Strelitzia reginae, however the leaves are smaller and tougher, so the splitting is not as exaggerated. The leaves on both varieties can also turn brown along the edges. In cultivation this is often caused by over fertilisation, once established the Bird Of Paradise plant does not need much fertiliser. Leaf browning can also be caused over watering, wet soil (root problems) and a lack of water especially in spring. With Strelitzia reginae, moving it from a shaded position to full sun can also cause brown spots and leaf problems. Not so likely however still possible growing can be caused by the use of pesticides and herbicides. If grown indoors, in very low light, the leaves can also turn a pale green, this is especially true if they are over watered. Propagation is by division or from seed, in the home garden seed can take 2-3 years to germinate, so be patient. Increasing popular are dwarf varieties, they seem to be claimed to range in size a little from around 50cm up to 1m, so you really need to be sure of what you are buying with this one. We suggest that between 80cm and 1m is a realistic expectation. These dwarf cultivars are around 1/2 the size of a full sized plant, and are an excellent choose for the front of the border or for growing in containers. S. Reginae, S. Reginae Miniature, S. Dwarf, S. Alba, S. Nicolai, S. Juncea, S. Caudata, S. Mandela Gold and S. Parvifolia although not all species are readily available for sale in Australia..